As Joseph L. Rotman often said, philosophy transformed his life. He didn’t intend to study the subject when he came to Western in the late 1950s, but after one course with the chair of the Department of Philosophy, Alistair Johnston, Rotman switched his major from Business. Philosophy not only awoke his thirst for further learning, but the values and critical skills he acquired stayed with him for the rest of his life. Indeed, his philosophical education informed everything he did thereafter – from his successful business career to his work as philanthropist and patron of the arts. As he had done with the Rotman School of Management in Toronto, Rotman’s intention at Western was to build something enduring that would positively impact Canada and the world. True to his philosophy of philanthropy, his gift, first and foremost, was of his own time, skill in working with people and experience in strategic planning. Western’s Department of Philosophy has long been one of the leading lights internationally in philosophy of science. It was thus fitting that Rotman’s initial donation funded the Rotman Canada Research Chair (CRC) in Philosophy of Science. At the same time that Robert Batterman was hired to fill the Rotman CRC, Charles Weijer was recruited into the CRC in Bioethics. The timing of their recruitments was coincidence, but it proved to be fateful. Using infrastructure funds that came with their research chairs, professors Batterman and Weijer had an idea to build something new. Philosophy is commonly thought of as a solitary pursuit; teamwork on projects is unusual. But the complexity of the philosophical issues raised by contemporary science demanded then – and continue to demand today – a new approach. Their idea was to emulate key features of a science lab – teamwork, trainees and shared space – in philosophy. In so doing they created the world’s first ‘philosophy laboratory’ – the SEER (Science Epistemology and Ethics Research) Lab, bringing together graduate students, postdoctoral fellows, philosophers and scientists to work collaboratively on issues in contemporary science that impact society at large. Rotman immediately saw the potential. A passionate Canadian and keen observer of society, Rotman saw a gap in social discourse about science and technology that only philosophy and the humanities, in general, could fill. The boffins of science and technology can tell us what can be done, but we need philosophers or humanists to lead Canadians in discussions about what should be done. During his first visit to SEER in March 2008, Rotman met with the lab. It was an encounter all present will never forget. Each of us was questioned about our work and how it would make a difference in the world. Rotman was particularly taken by the talent of our trainees, remarking that “these are the best students I have seen in 20 years of working with universities.” It was plain that all present shared a vision of a future in which scientists and humanists work side by side. 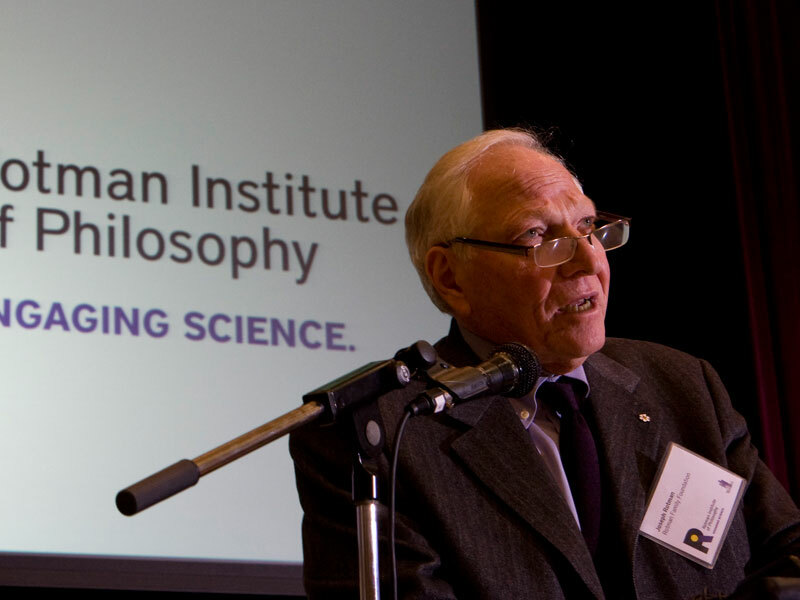 By November 2008, a new donation from Rotman created the Rotman Institute of Philosophy, which is dedicated to collaborative research between scientists and humanists, training the leaders of tomorrow and public outreach. While the Rotman Institute is now only six years old, Rotman’s impact on our growth and ambition has been profound. As a donor, he was deeply involved in the institute’s development, but keenly aware and respectful of academic freedom. He helped us recognize the importance of establishing a clear intellectual identity among our peers and the public. This is reflected in our brand, which brilliantly distils our approach into two words: Engaging science. Rotman continually encouraged us to think big. In order to succeed, the institute must transcend disciplinary boundaries and extend its reach across Western’s campus and beyond. He insisted our work make a difference by leading conversations with Canadians about science and its impact on society. Each of these aspects of Rotman’s vision is reflected in the institute’s current strategic plan. Working with Rotman was a transformative experience for each of us. In a society that can often seem defined by quick success and instant celebrity, Rotman was refreshingly ‘old school’ while remaining intellectually adventurous. He had high standards and demanded a great deal of people working with him. Working with him, at times at least, meant failing to meet his expectations. His energy, intellectual vigor and ambitious goals inspired us to do better. The effect on each of us was to be constantly pushed to innovate, to work harder and to make substantive and novel things happen. And when an idea was good and a project succeeded, there were no sweeter or more meaningful words than his praise. Rotman’s interest and leadership in research initiatives on the human brain also inspired a closer collaboration between the Rotman Institute and Western’s Brain and Mind Institute. This, even from an international perspective, unique collaboration between philosophers and neuroscientists has resulted in several new projects both on the nature of consciousness itself and on the ethics of care for patients who are minimally conscious. In addition, Rotman’s donation and his ability to convince Western of the importance of the vision of the Rotman Institute, made it possible for us to recruit several internationally leading faculty members, including two new CRC’s and an endowed chair in the philosophy of neuroscience. As the Rotman Institute now enters a new era, the recent loss of Rotman is keenly felt. However, his vision and demand for excellence remain with us. See also Western’s main Legacy Page for Joseph L. Rotman, which includes a brief biography, links to articles, and details about Rotman’s numerous contributions to Western.